The high-intensity interaction of proteins with other macromolecules can cause signifi cant changes to protein properties such as translational mobility, for example, or their conformational states. Accordingly, the study of proteins in macromolecular environments that typically very closely resemble physiological conditions or cell-like environments is of great interest. 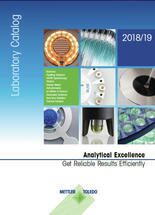 In theory, confocal fl uorescence microscopy enables the selective analysis of selected proteins in such environments. In practice, however, a number of methodological diffi culties and artifacts of technical measuring need to be accounted for or circumvented, in order to characterize proteins reliably and quantitatively. The vast majority of our knowledge in the fi eld of protein biochemistry stems from experiments with proteins that are present in highly dilute form in buffer solutions with concentrations of a few grams per liter. These conditions are very different to those that are present in the living cell, however. The cellular cytoplasm is enriched with a wide variety of macromolecules. These can make up as much as 20 % of the cell volume, which results in concentrations of a few hundred grams per liter (“molecular crowding”). The resulting “excluded volume” effect can lead to an increase in the effective concentrations of cellular proteins and change key physical properties of the solution. Accordingly, in the cytosol, the proteins’ molecular mobility and dynamics can be reduced in these confi ned volumes, for example. Possible consequences of this molecular crowding are reduced rates of diffusion, shifts in the balances of protein-protein and protein-substrate associations, and changes to the conformation dynamics of individual proteins . For proteins in such environmental conditions, confocal fl uorescence microscopy can provide a very detailed set of information. Alongside measurements made directly in living cells, which are technically complex and which typically do not deliver the same kind of data quality as in vitro measurements, cell-like environmental conditions can also be emulated by non-biological macromolecules (e.g. PEG, Ficoll). In all of these cases involving a higher concentration of macromolecular “crowders”, one has to assume there will be potential artifacts in a quantitative data analysis due to the solution’s higher refractive index and molecular collisions from crowder molecules. Fig. 1 Schematic representation of a confocal fluorescence microscope with simultaneous dual-channel detection (A). The fluorescence emission light can be split using a dichroic mirror into two different colors for FRET applications or by using a polarizing beam splitter into two polarization components for use in TRA applications. In addition, auto- and cross correlations (FCS) can be performed with the signals of the detection channels (B). 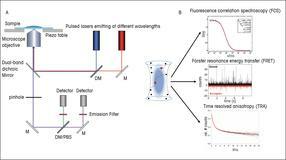 With confocal fluorescence detection, the excitation light is focused on a small diffraction-limited volume in the protein solution. 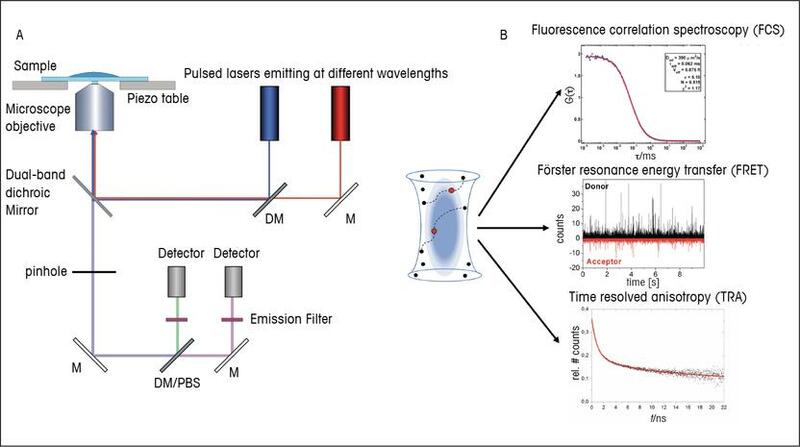 Optimum information content in terms of measurement with freely diffusing proteins can be received by using what is termed “fluorescence multiparameter analysis”. This involves the use of pulsed laser light excitation with simultaneous dual-channel fluorescence detection (see Fig. 1 and ). 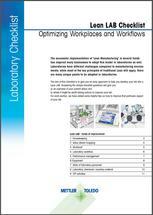 Three methods are most commonly used to characterize protein properties, as follows. First, fluorescence correlation spectroscopy (FCS) provides detailed information about the protein concentration in the sample solution and about the protein’s translational diffusion. Second, fluorescence resonance energy transfer (FRET) can be used to study bimolecular bindings between interaction partners. In addition, appropriate use of dye marking can be used to track protein conformations and conformational changes. Thirdly and lastly, time-resolved fluorescence anisotrophy (TRA) enables the determination of the rotational motion of the proteins within a specific time frame. All of these parameters and their variation due to macromolecular environments play a key role for intermolecular interactions, as they occur in enzymology or in biological signal processing, for example. When applying high-resolution confocal fluorescence microscopy to a sample with a high concentration of macromolecules (crowders), two factors have an essential role to play. An increase in the measurement solution’s refractive index (with reference to water for water immersion objectives) results in a changed confocal detection volume (both in size and in shape). This can cause numerous artifacts, primarily in the FCS analysis . In addition, the high concentration of macromolecules in the protein environment produces a high rate of molecular collisions. One consequence is a reduction in the proteins’ translational mobility and rotational motion in this solution. In addition, however, and depending on the nature of the surrounding macromolecules, the fluorescence property can also be changed by molecular collisions (see Fig. 2). Such “fluorescence quenching processes” have a serious impact on the fluorescence quantum yield of the dye that is bound to the protein. For this reason, quantitative FRET analysis requires the determination of the quantum yield of each bound dye substance for the various environmental conditions . We recently established a method that can be used to perform measurements to determine quantum yield quickly and easily with the confocal microscope . In general, the challenge with measurements such as these is a case of identifying the measurement artifacts in the measurement data obtained, and separating them out so as to determine reliable parameters for protein properties. For in vitro measurements, i.e. for solutions with artificial crowders or for lysates, with suitable calibration measurements, this is generally possible. Fig. 2 For a protein (streptavidin), the dependency of its diffusion coefficient on the viscosity of a macromolecular solution (crowder: Ficoll70) is shown at various crowder concentrations. The experiment reveals that the data measured cannot be described by applying the Stokes-Einstein equation (A). For fluorescent dyes bound within the protein at specific sites (B), the quantum yield can vary either according to position (e.g. amino acid 202 or 256) or – interestingly – to variations in the protein environment. Measurement data for determining the quantum yields (see ) and the resulting values are given in Figure C.
A well-known phenomenon of highly concentrated macromolecular solutions is the increased viscosity in comparison to buffer-only solutions. This increased viscosity leads to a reduced translational diffusion coefficient. In a qualitatively similar way, the rotational motion of the dissolved proteins is also retarded in macromolecular solutions. Both effects are good candidates for investigation with FSC and time-resolved fluorescence anisotropy (see Figs. 2, 3). A quantitative description of the translational movement in relation to viscosity (h) is provided by the Stokes-Einstein equation (see Fig. 2) and by the Stokes-Einstein-Debye equation for rotational motion (~1/ç). Typically, the viscosity of macromolecular solutions is measured using a falling ball viscometer and the reading is then used in the abovementioned equations to describe the diffusion behavior. What is interesting here is that the diffusion values obtained from fluorescence measurements deviate significantly from the behavior as predicted by the equations (Fig. 2, 3). This can be explained if we consider the fact that the effective viscosity for a diffusing protein depends on the size of the macromolecular crowder. On closer inspection, we actually discover that, essentially, the size ratio of the diffusing protein and the surrounding crowder presents us with the relevant parameters. A similar behavior can also be observed in terms of rotational diffusion. In addition, there are also indications that the rigidity of the crowder (i.e. a flexible or rigid compact macromolecule) and the shape of the diffusing proteins exert an influence on the protein diffusion. All of these diffusion properties can potentially have a direct effect on association rates and thus on intermolecular bindings between interaction partners in cellular processes. Fig. 3 Diffusion properties are not only influenced by the concentration of the crowder molecules but also by the size ratio between crowder molecules and diffusing proteins (A, B). This can be seen clearly illustrated by plotting the ratios between diffusion in the crowder (D) and diffusion in a buffer-only solution (Ds) against the corresponding viscosity ratios for translational diffusion (B). Size dependencies can also be identified for rotational diffusion (C). In other examples, we have used fluorescence anisotropy measurements to characterize the rotational motion of proteins that were manufactured using cell-free protein synthesis. This work focused on the comparison of proteins and polypeptide chains that were still bound to the ribosome directly after synthesis with those whose peptide chains were already separated from the ribosome . Here, too, molecular collisions often have a major part to play – in this case between the polypeptide chain and the ribosome. These collisions significantly reduce the protein’s rotational motion while also exerting an influence on co-translational protein folding, which already begins with the incompletely synthesized nascent polypeptide chain when still bound to the ribosome. First publication: Fitter, J., Kempe, D., q&more, 1.2016.